Cenotes, Yucatan, Mexico. In the depths below the peninsula of Yucatan in Mexico a complete different world is opening up to scuba divers. A huge cave system stretches through large parts of the area with thousands of sinkholes allowing humans to enter a magical place. 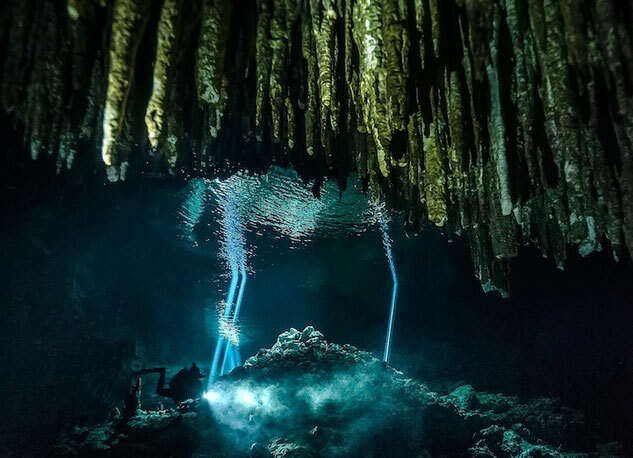 These cenotes offer a completely different scuba diving experience with overhangs, limestone caverns and light rays piercing through crystal clear waters and personally we think they are one of the most magical things in the world. The Yucatan Peninsula is home to the greatest number and variety of cave and cavern diving sites in the world. Let us tell you more about one of mothers natures greatest gifts. Not to be confused with cave diving. 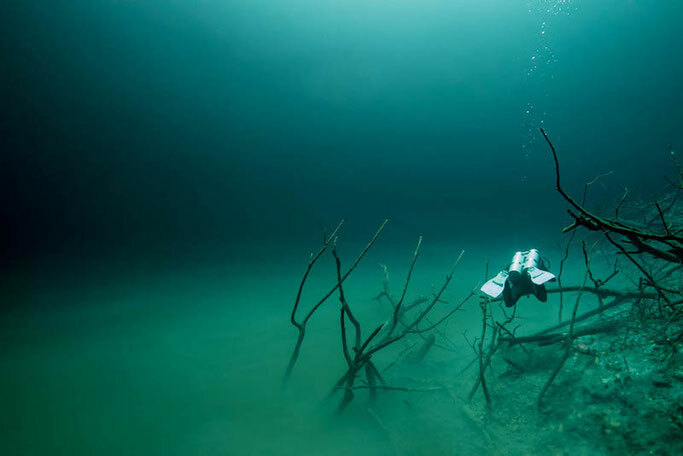 So what actually are cenotes? To put it simply they are sinkholes filled with waters. Yucatan used to be under the surface of the ocean and the limestone we see today built up from fossilized coral and the ocean floor. When the peninsula started to rise above sea level underwater rivers started to build a cave system. The caves flooded which allowed divers today to swim around these ancient formations. In some caves and caverns even ancient Mayan pottery and bones can be found. The cenotes are basically caves that have collapsed. The ones that are only half flooded are also accessible for snorkelers and to do other fun activites like zip-lining, kayaking and swimming. The top layer of water in the cenotes in Yucatan is freshwater. When you scuba diver further down than 10m to 20m (depending on the cenote) you will reach a so called halocline between the freshwater to the denser saltwater. The haloclines look like a mirror inside the water and leaves your vision blurry while going through it. Your guide will make sure that every diver gets a chance to play around with the haloclines before it all gets stirred up by bubbles and fins. 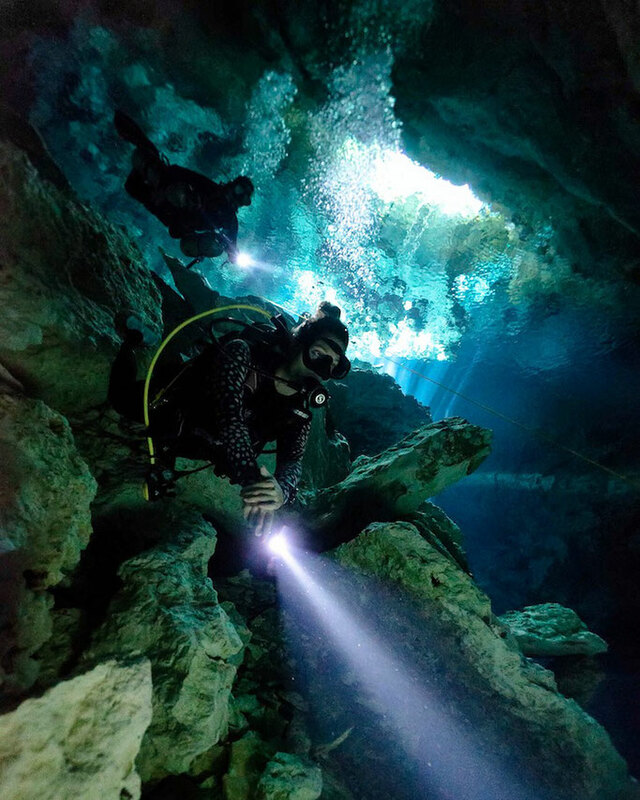 What is special about cenote / cavern diving? In the cenotes you will be diving in caverns, this means that you will be in an overhead environment. For safety reasons your guide is a fully trained cave diver with special equipment and will never guide more than 4 people. If she or he dives with a single tank this means that safety standards are not met and you should not dive with this guide. Cavern diving means that you will never be further than 40m away from the surface, you will always see natural light and you will not enter a cave. Entering a cave means to swim inside a hole where you would have to turn around to get out again. Scuba diving in caverns is more like overhangs and swim-throughs. During the dive the group is following a line to make sure that no one gets lost or moves too far away from the entrance. The only extra equipment you should bring to a cavern dive is a dive torch (or if you have a spare one, better bring two). Besides the light you won’t need any special equipment. 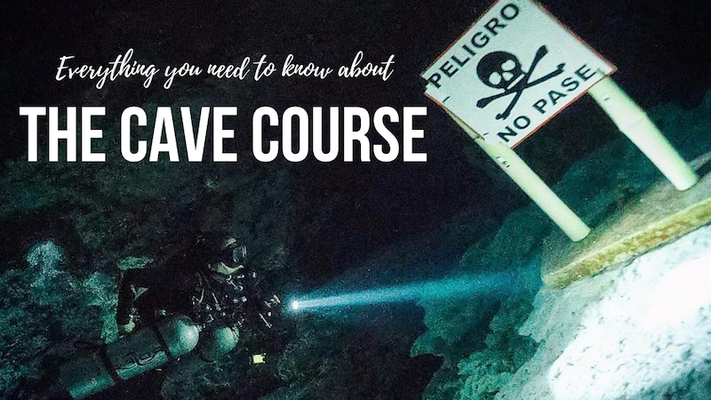 Want to find out more about cave diving and the cave diving course? Take a look at our in-depth article. Who should go scuba diving in a cenote? Basically you are allowed as soon as you have your diving certificate. However, it is recommended to have good buoyancy control to make sure that you do not to stir up the sediments from the floor or destroy the rock formations bumping into them. The guides will only bring advanced divers to the more delicate and difficult cenotes. Once a stalactite or stalagmite breaks off it is gone and can only grow back during the next ice age - just think about that. Sand stirred up from the ground decreases the visibility and as there is only very little current it will stay for a long time. You can dive the cenotes in Yucatan all year round. The visibility is always incredible (except if someone stirs up sediment) and the water temperature is around 26°C - you'll need a wetsuit! What will you see in a cavern? One of the best things in the cenotes in Yucatan is the light play from the sun’s rays meeting the crystal clear water. Other highlights are limestone caves decorated with stalactites and stalagmites, as well as some Mayan bones and pottery. Furthermore it is possible to play around with the halocline which look like another water surface inside of the water. You can see them from above and from below, while swimming through them they stir up and everything will become blurry. It's fun once you've got your head around what is happening! There is not much wildlife in the caverns. In the ones with larger openings you might find fresh water fish, turtles and in one even there is even a small resident crocodile! 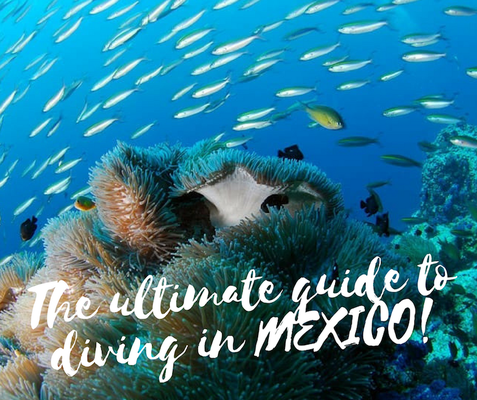 Each cenote has something unique about it and all of them are absolutely beautiful, so it doesn’t really matter which dive sites you choose, but here are some of our favourites! This is possibly the most famous cenote. It can get a bit crowded, but it is a beautiful place where you can do two dives in the same location. Dos Ojos are nicely decorated with stalactites and stalagmites, and a fun part about the dive is you can surface into a bat cave and watch bats fly above you. This cenote is also great for snorkelers. In this cenote the halocline can be seen very clearly, it doesn’t have too many rock formations, but in the entrance area you will see wonderful light effects in a mystical green colour. At 30m, a thick cloud is formed where you can watch as people disappear in it (an illusion obviously - they don't actually disappear). Below the cloud the water is very clear and full of mysterious dead trees amongst the dark. The cloud is actually built up from hydrogen sulphide produced by bacteria breaking down the trees and leaves which is stuck between the fresh and the saltwater. This is also our favourite cenote to freedive in! The light effects in this deep ( up to 119m - for certified divers only) cenote are spectacular; a wide round hole without much overhang offering the clearest water you have ever seen with a natural light show piercing down to 30m. At around 15m you encounter a halocline and at 30m a hydrogen sulphide layer. This is another cenote where the halocline is very clear and divers can play around with the layers; great for photography and an intro to cavern diving. This cenote got its name from people actually washing their car in it. A very special thing here is that you might see a small friendly crocodile. The cenote is easy to dive in, it has a nice green colour and many dead trees as well as beautiful water plants like lilly pads. You might also see some turtles and fish which are rare in other cenotes. Another great one to snorkel and freedive in, however sometimes (when they feel like it) they don't let snorkelers use fins.. This cenote is incredibly decorated with stalactites and stalagmites. It is also a bit narrower, so it is only recommended for more experienced divers with good buoyancy control. You will find an incredible amount of dive shops in Playa del Carmen and Tulum. The dive shops usually have a schedule of cenotes they will visit during the next few days. 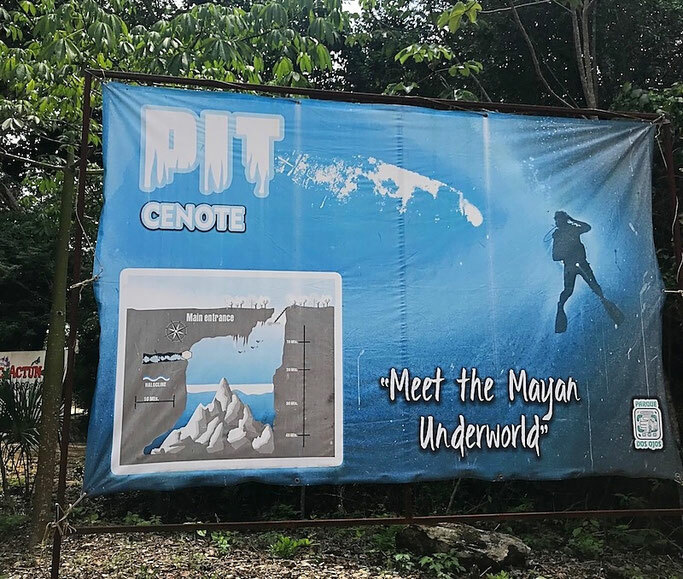 If you’d like to visit a specific cenote you will find a dive shop offering a trip there. Yucatan Dive Trek are one of the companies we dived a lot with while in Mexico (swimming with crocodiles, scuba diving in Xcalak) and our good friends of Girls that Scuba. They organise personalised tours of the cenotes and will recommend the best cenotes to dive in based on your certification, the amount of time you have and what you want to experience. No trip is too big or too small for them, so give them an email and let them know exactly what you are looking for. A popular dive centre in Tulum Koox Diving does more than just diving and will help you out with any of your chosen activities. We went night diving with crocodiles with them in a cenote which was super fun! They are a fun bunch of divers who know the area super well and have a dive centre on Tulum highstreet that you can just pop in to and say hey! To scuba dive the cenotes you will need to get to Playa del Carmen or Tulum. The best way to get there is to fly into Cancun. From the UK, US and many other destinations you can fly direct, sometimes as cheap as £300. We actually recommend staying in Tulum as it is a little less touristy than Playa and with a more laid-back atmosphere. We usually take a look on Booking.com for hotels to stay in Tulum town (Tulum beach is full of luxury resorts on the beach which are super pricey and more for those looking to relax and drink cocktails). Amancay Freediving took us over to the 'other side' and we completed our SSI Level 1 freediving course with them in the cenotes. It was one of the most amaxing experiences, and we highly recommended looking past just scuba diving the cenotes. 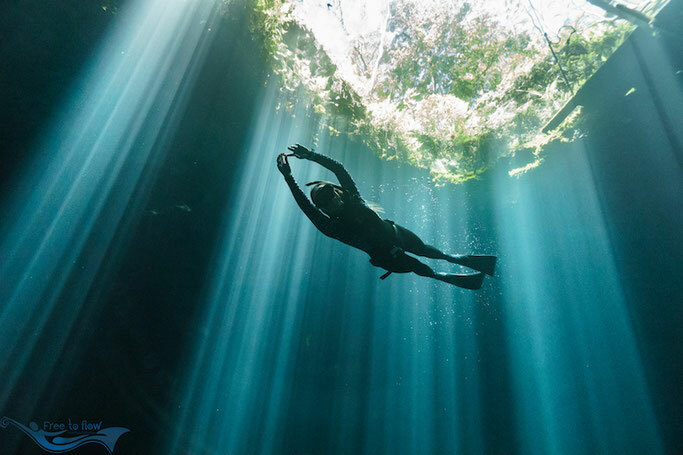 Read our full article on freediving the cenotes here. By Goni Boller; a scuba instructor, underwater photographer, biologist and blogger at More Fun Diving. She travelled and dived the world for almost 5 years non-stop while working as a writer and freelancer from the road.